Marilou T. Reeder received a Barbara Karlin Grant letter of merit in 2009. In 2010, she was awarded the SCBWI Pocono Mountain Retreat author scholarship, for writers who show exceptional promise. When she is not writing for children, she keeps busy with freelance business and technical writing. She currently resides in Wayne, Pennsylvania. Karl West is a freelance illustrator, doodler, and full-time coffee drinker. He produces both traditional and digital work from his studio in Dorset, England. 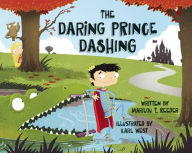 The Daring Prince Dashing by Marilou Reeder is an adorable book! My kids absolutely love this book. The illustration are incredibly fun and match the words on the page perfectly. This humorous tale is the perfect book to read to kids. Prince Dashing meets a girl who leaves behind her mysterious stick at the stroke of midnight so Prince Dashing sets off to find her. On his search he's led to the zoo where he goes on an incredible adventure and eventually finds the girl he's been searching for. She's every bit as adventurous as he is and the two begin a most adventurous friendship. My family and I love this book! You can find The Daring Prince Dashing by Marilou Reeder on Amazon, Barnes and Noble and other bookstores.